The book is set in a suburban nursing home, possibly in Perth, where Matron Hyacinth Price presides over a ramshackle establishment, fleecing the residents of their money, while her brother (one of the residents) is himself fleeced by a few nocturnal card-sharks. The novel begins with the arrival of three old men at the home, including the titular hero, Martin Scobie, and from the moment they arrive, it is clear that the matron’s intention is that they quietly submit to the rules of her establishment, settling down for a slow, peaceful drift into the next life – preferably having signed control of their finances over to Ms. Price herself. Although Scobie is eighty-five years old, he appears to be in fairly good health, both physically and mentally, and he immediately decides that he needs to get out as quickly as possible. When this proves to be more difficult than first imagined though, the awful conditions he is placed under soon start to take their toll. Will he manage to escape while he still has time, or will the matron get her hands on his hard-earned money? Mr. Scobie’s Riddle begins with a comical exchange of diary entries between the formidable Hyacinth and her night nurse, Mrs. Shady, a woman whose spelling and grammar eventually prove only superior to her dubious morals. The reader is aware of the kind of establishment which awaits them at The Hospital of Saint Christopher and Saint Jude within a few pages, with its dirty floors, substandard food and clandestine midnight card games. This satirical tone pervades the novel, and it contrasts well with the more poignant approach taken when focusing on the poor Scobie. Aside from the humour of the daily goings on and the quiet dignity of Scobie’s time in the home though there is a more chilling undertone to the story. The Matron’s attempts to defraud her residents are loathsome enough, but the humiliating treatment Mrs. Rawlings dishes out is perhaps worse. The residents are gradually worn down, their independence eroded bit by bit as they are made to endure unwelcome showers, forbidden to have a cup of tea in the afternoon, prevented from going for an afternoon stroll. It is this demeaning, degrading treatment which at times makes Mr. Scobie’s Riddle difficult to stomach. The saddest part, of course, is that there is nobody to help, mainly because those who should be helping are the ones who the residents there in the first place. Both Scobie and Mr. Privett, one of his room-mates, have been packed off to the home by relatives eager to get their hands on their land – unintended victims of the Australian obsession with real estate. Even the so-called healthcare ‘professionals’ who visit the home are of no use: the student social worker driving mummy’s car; the doctor who checks pulses and winks at the matron; the health inspector, distracted from his task by lashings of Matron’s sherry. It’s not exactly a good reflection of how we treat our elderly. 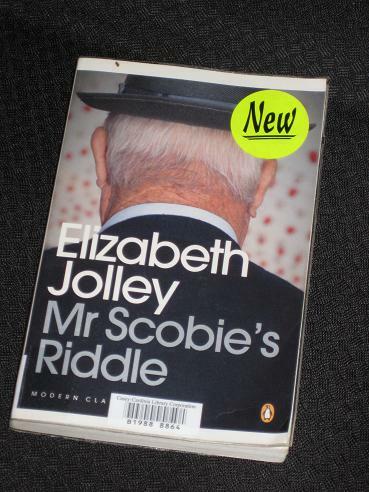 In Mr. Scobie’s Riddle, Jolley has created an excellent snapshot of life at a nursing home, a nuanced picture where it’s very difficult to separate the characters into their respective pigeon-holes. The Matron is often portrayed as uncaring and money-grabbing, yet we also see her at her most vulnerable, alone, depressed and with financial troubles of her own. While Scobie is the natural hero, dignified and resolute in his struggle, there are indications, worrying signs of frailty, that the home may be where he belongs after all. It would be very easy to judge the behaviour on show, but the writer always reminds us, just in time, that needs must, sometimes at the expense of human niceties. Sounds wonderful, but why did it make you squirm? The book reminds me of Simon's Night by Jon Hassler. It's the story of a retired professor of English who lives in Minnesota. He decides to move into a retirement home in town as his place is out in the country. Big mistake. The retirement home doesn't allow for any independence and the person who runs it really wants the old codgers to veg around the telly. It's quite amusing actually. I have only tried to read on Elizabeth Jolley novel, and I didn't get on with it at all! This sounds very interesting but I do understand why this would be hard to read. I worked in a nursing home while I studied and it was one for the rather well off, still I was madly depressed afterwards and swore to do all sorts of things before having to spend my final days in an institution like that. I'm afraid the book sounds realistic. It's hard on the people working there as well. I think it's one of the big themes of our society and will be ebven more so in the years to come. Thatnks for the review, I think I'd like to read it. Guy – The inhuman, degrading treatment the residents suffer through makes you squirm as a reader. It's great stuff, but hard to read at times. Caroline – Yes, it's probably one of those things we'd all rather not have to think about. That's what's good (and bad!) about this book. It is a disturbing book, but quite brilliantly done, I think. Jolley was definitely one of those writers who gets under your skin. I'm looking forward to reading the new bio of her which lifts the lid on her life and reveals that not all was as it seemed.